Cologne - Having won the Bundesliga title as coach an astonishing seven times with FC Bayern München and Borussia Dortmund, Ottmar Hitzfeld is better placed than most to analyse Germany's top tier. Speaking exclusively to bundesliga.com ahead of the season curtain-raiser between Bayern and VfL Wolfsburg on Friday, the veteran tactician, who retired from active duty after leading Switzerland to the round of 16 at the World Cup in Brazil, outlines how he views the rivalry between his former clubs and gives his thoughts on which other sides could challenge at the top. bundesliga.com: Ottmar Hitzfeld, how much can be read into the Supercup match between Borussia Dortmund and FC Bayern München with a view to the upcoming Bundesliga season? Ottmar Hitzfeld: The Supercup came too soon for a lot of players who were at the World Cup and neither team put out their strongest XI, so that makes analysing it difficult. At the end of the day, Dortmund were a lot better, although Bayern did play a lot of youngsters. bundesliga.com: Did it give you reason to think Dortmund could be title contenders again this season? Hitzfeld: You could see they’re definitely aiming high this season. Despite losing Robert Lewandowski, coach Jürgen Klopp certainly has more options available to him to change his formation and can play one, two or even three strikers now that they’ve signed Ciro Immobile, Adrian Ramos and Dong-Won Ji. It’ll be important to get off to a better start than they did last season, as you’re never going to catch Bayern up once they've established a lead at the top. Hitzfeld: That’s true and I can see them having a few difficulties to start with until they get all of their World Cup winners properly fit and integrated back into the side. After such a long tournament that will take a certain amount of time. bundesliga.com: Especially now that the injury to Javi Martinez has disrupted plans to play with a three-man back line. Do Bayern need to bring in a new player? Hitzfeld: They’ve got an outstanding squad that offers them plenty of different options, especially in attack, but in defence Pep Guardiola can also vary things around. Holger Badstuber coming back is almost like having a new recruit too, and players like Bastian Schweinsteiger and Thiago Alcantara, who are both currently injured, can play anywhere in midfield. There aren’t many squads that can match Bayern’s in Europe, which is why the loss of Martinez can be compensated for. bundesliga.com: Guardiola had an excellent first year in the Bundesliga. Do you think that’s made him stronger? Hitzfeld: It’s definitely an advantage that he now knows the Bundesliga, the opposition and above all his own club a lot better. He always tries to keep his players on high alert. He experiments a lot and tries to coax the maximum possible from his team. At the moment he’s pushing forward with playing three at the back. bundesliga.com: Which teams will be hottest on the heels of Bayern and Dortmund? 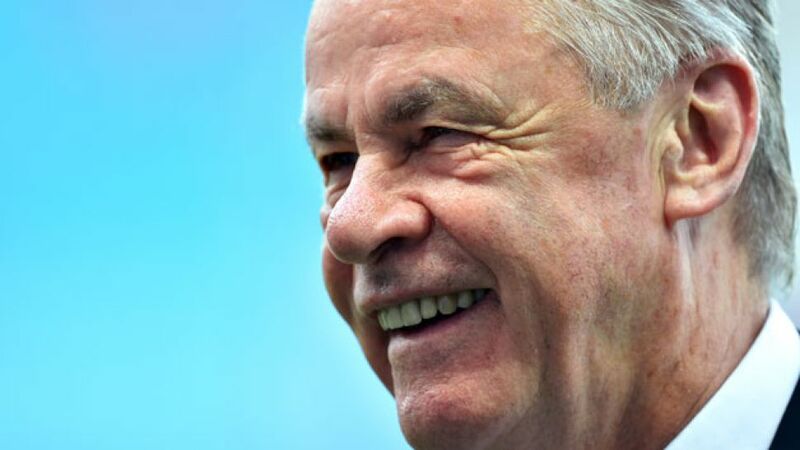 Hitzfeld: Schalke, Leverkusen and Wolfsburg, and maybe Gladbach too. Those four will try to keep in touch at the top and make sure the two favourites don’t have things all their own way. Schalke had a terrific second half of the season last term and showed that step by step they’re establishing themselves as the third major power in the Bundesliga. That said, Leverkusen have strengthened greatly in attack and that means they should not be ignored. bundesliga.com: And what chances do you think the promoted sides have? Hitzfeld: Teams like SC Paderborn make the Bundesliga interesting. Sides trying to compete with fewer resources are extremely likeable. They have nothing to lose and will give everything to stay up. I’m really glad Köln are back. They’re a club steeped in tradition and they’ve got a very good coach at the helm. They’re primary objective will surely be to avoid relegation but their fantastic fans will be good for the league. bundesliga.com: To what extent will Germany’s World Cup triumph boost the Bundesliga? Hitzfeld: German football is constantly developing. If the Spanish league still had an advantage prior to the World Cup, then that’s certainly be cancelled out now. The Bundesliga product is world class and it will spur every team on. bundesliga.com: What are you most looking forward to this season? Hitzfeld: I’m excited to see how the teams have developed. At the World Cup you could see that many teams had a similar playing style in terms of tactics, for instance with their pressing and counter-pressing. I’m sure we’ll see a lot of that in the Bundesliga. On top of that I hope to see a lot of new, young players, especially from our European Championship-winning Under-19 side, who caused such a stir.